Q3 2011 Healthcare Industry Trends - Berkery, Noyes & Co., LLC. The most active acquirer through Q3 2011 was PerkinElmer, Inc. with 4 acquisitions: Labtronics Inc., Geospiza, CambridgeSoft Corporation and ArtusLabs, Inc.
Blackstone Group LP’s announced acquisition of Emdeon, Inc. during the third quarter was the largest transaction through Q3 2011, with an acquisition price of $3.03 billion. Total transaction volume in Q3 2011 decreased by 6 percent from Q2 2011, from 70 to 66 transactions. 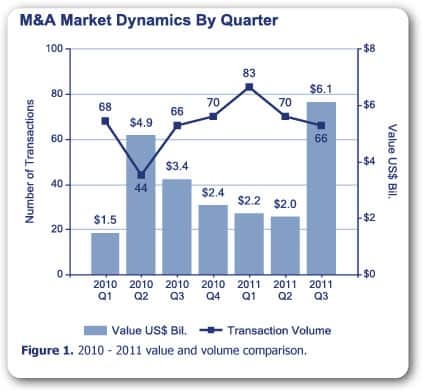 Total transaction value in Q3 2011 increased by 205 percent from Q2 2011, from $2.0 billion to $6.1 billion. This was due to Blackstone Group LP’s acquisition of Emdeon, Inc. in the third quarter. 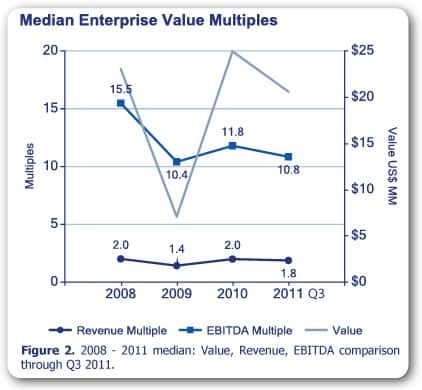 Median EBITDA multiples from 2010 to the first nine months of 2011 went from 11.8 to 10.8, an 8 percent decrease. Median revenue multiples from 2010 to the first nine months of 2011 decreased from 2.0 to 1.8, a 10 percent decline. Median value also declined. The top ten deals by value have increased, with five acquisitions entering the list from Q3 2011: Blackstone Group LP’s acquisition of Emdeon, Inc., OptumHealth Inc.’s acquisition of Connextions, Vista Equity Partners’ acquisition of Sage Healthcare, Aetna Inc.’s acquisition of PayFlex Systems USA, Inc., and SAIC’s acquisition of Vitalize Consulting Solutions. 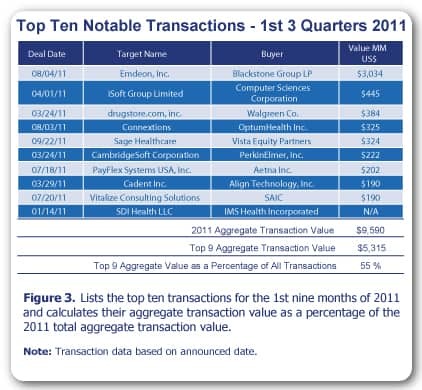 These five transactions, with an aggregate value of $4.1 billion, represent 43 percent of transaction value in the 1st 3 Quarters of 2011 and 67 percent of Q3 transaction value.